General entry for the race is now sold out – but The Forever Friends Appeal have a limited number of charity places available. Don’t miss out on your chance to run! 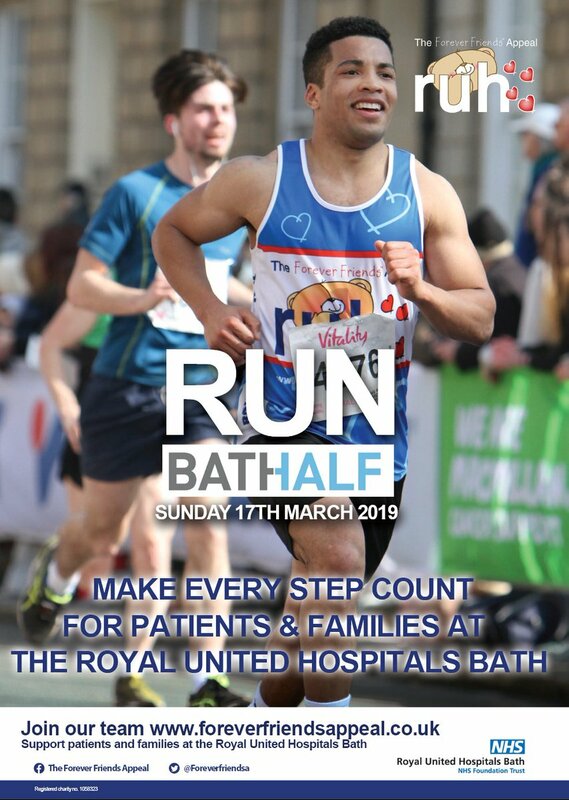 It’s time to make every step you take, from now until March, count for patients & families cared for by the Royal United Hospitals Bath. Join our running team today and you will receive a fundraising & training pack and RUH team running vest too! Places cost £35 and you will need to agree to raise a minimum of £175 sponsorship for any ward/department at the RUH. Registration is now open for this popular walking marathon and 10 mile trail, along the beautiful Kennet & Avon canal. The sponsored walk is organised by the charity for the RUH, The Forever Friends Appeal, so every step you take will support patients and their families, at a time when they need it the most. Legendary Glastonbury Festival founder, Michael Eavis CBE will be back again to open the start of the walk’s epic 26.2 mile (approx.) route in Bishops Cannings, near Devizes. From there the walk heads along the towpath, through Bradford on Avon, before finishing at the iconic Holburne Museum in Bath. The 10 mile afternoon route joins in the fun in Bradford on Avon. The walk was originally created with and in memory of a wonderful lady, Vanessa Kyte, who passed away from cancer in 2007. Since then, thousands of people have taken part to celebrate the life and memories of their own loved ones, to show support for someone receiving treatment or simply to take on the challenge. As a local hospital serving Bath, Somerset and Wiltshire the RUH touches the lives of over half a million people, whether as a patient ourselves or visiting a loved one. It’s where our babies are born, where our broken limbs are repaired, where we fight diseases, face the challenges of old age, learn to manage long-term conditions and so much more. The vital funds raised from the walk will help pay for extra special projects and state-of-the-art equipment (beyond the remit of the NHS) that will transform care for the hundreds of thousands of patients and families cared for each and every year. Open to both men and women. Early bird entry costs £20 until 3rd December and £25 thereafter (includes a t-shirt, medal, water and treats along the way & lots of support) and you can choose to walk in support of any ward, department or campaign at the RUH that’s close to your heart. The event is proudly sponsored by Kier Construction and M J Church. ★ To sign up, visit foreverfriendsappeal.co.uk or contact Laura in the Events Team on 01225 821535. Bath Ghost Tours - The Haunts Of The City!